Can you tell us a little about the story of Aww Jeez and some of the concepts and theme’s within the film? 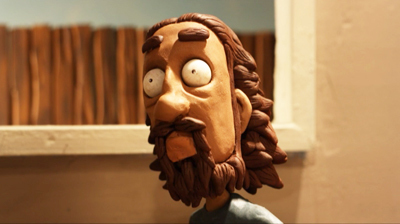 Aww Jeez is a short clay-animated film that takes religious dieties and puts them in a cheesy 50s sitcom environment. Essentially the story is; God is going away on business, but he doesn’t trust his slacker son Jesus not to throw a party while he’s gone, so he hires Satan, a former alcoholic, to babysit. The humor of the film is based around making light of religious mythology, while simultaneously exploring the way sit-coms utilise familiar characters and plotlines to create stories and explore ideas. The film really is my personal love letter to the situational comedy genre, so by using characters that almost everybody recognises, it allowed me alot of freedom to run wild, making a mixture of jokes at goofy sitcom cliches (like the flashy main character entrance) and more in depth religion themed humour. Fortunately for me I teamed up with an amazing sound designer and composer on the film named Ryan Granger who did an awesome job realising the kinds of theme music and audio cues which make sitcoms so fun and energetic. This entry was posted in Composer, Recording/Mixing, Sound design. Bookmark the permalink.